O grace! O heaven defend me! “I have been accused of being inimical to the true interests of the colored people’ but this is not true. I am one of their best friends; and time, which tries and tests all, will demonstrate the fact…I once said I would be the Moses of your people, and lead them on to liberty–liberty they now have…I have been blamed for vetoing the Freedmen’s Bureau Bill, and have been also represented to the colored people as having done it because I was their enemy. This is not true…The ordinary course of judicial proceedings is no longer interrupted. The courts, both State and Federal, are in full, complete, and successful operation, and through them every person, regardless of race and color, is entitled to and can be hear. 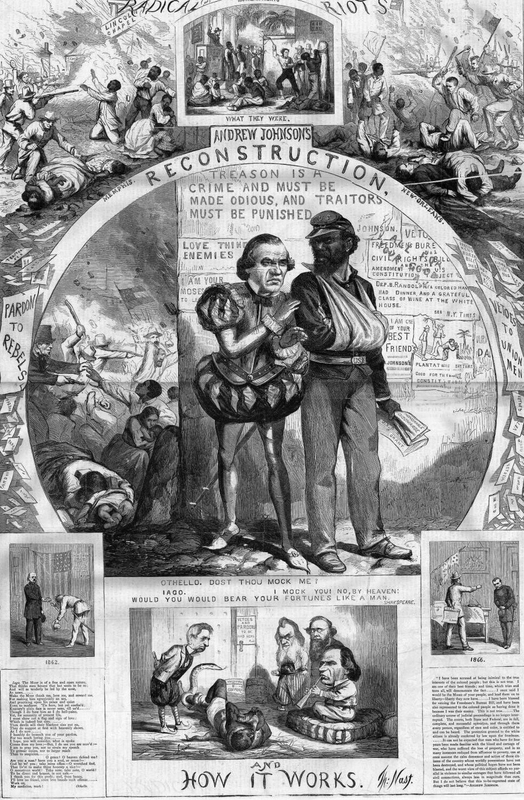 The protection granted to the white citizen is already conferred by law upon the freedman….It can not be expected that men who have for four years been made familiar with the blood and carnage of war, who have suffered the loss of property, and in so many instances reduced from affluence to poverty, can at once assume the calm demeanor and action of those citizens of the country whose worldly possessions have not been destroyed, and whose political hopes have not been blasted, and the worst view of this subject affords no parallel in violence to similar outrages that have followed all civil commotions, always less in magnitude than ours. But I do not believe that this to-be-regretted state of things will last long.”– Andrew Johnson.